At the outset, let me say that I think there is more depth to, and power in, the Lord’s Supper than many of us realize. It’s not that we are not being fancy enough about it, or that it needs to become a complex religious ritual. But in its simplicity we can dive deep into the symbolism and significance of the bread and the wine and derive much benefit from it. So here are my reasons for deepening our understanding of Communion, and doing so weekly. Reason #1: this is a “communion” feast. The word Paul uses in verse 16 that is translated “communion” is koinonia. This is not just something we do simultaneously. It is a reinforcement of our bond together as members of the Body of Christ. This bread and wine symbolize our joint participation in the Body, and with each other. Why would anyone NOT want to do that every week? Our fellowship, or koinonia, was purchased on the cross and we need to be strengthened in that as we remember the source of our fellowship, Jesus. For that reason, I believe it is entirely appropriate and even desired to wait until all are served and then partake together. It’s not some legalistic requirement, but does drive home the point. Reason #2: This blessing can become a curse if taken lightly! Our fellowship together and our joint sharing in the divine nature with Christ are very important to God. After all, look at what this cost! Because of that, this very “cup of blessing” from chapter 10 can turn into a curse for those who fail to discern that fellowship and its importance. Paul prefaces his warnings in chapter 11 of First Corinthians by addressing their lack of true fellowship. They were eating a supper all right, but it was not the Lord’s supper! No, the Lord’s Supper was not to proclaim their own worthiness, but to proclaim the Lord’s death, which is the basis for that worthiness! Not discerning the Lords body, the one broken on the cross and His body in those sitting around you, can be lethal! God will discipline His children, and He is not going to let one of us be guilty of the body and blood without judging it. 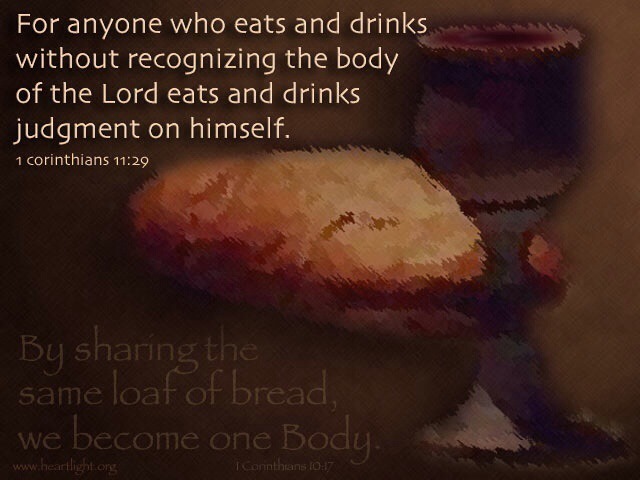 I realize that this is a heavy subject, but we need to take the weekly observance of the lord’s Supper/Communion very seriously. To those who judge themselves and discern the sacrifice that was made and our basis for fellowship because of that sacrifice, it will truly be a “cup of blessing”. But if you don’t know The Lord and are not saved and part of His body, it would be better for you to abstain from taking it. It would be BEST to come to Christ, become part of His body, and the partake every week! We should approach Communion with a deep sense of joy, gratitude and awe. Not in a somber, “religious” way, but in true appreciation for our own salvation and that of those around us who, together with us, are parts of the Body of Christ.